The salesman was very helpful and didn&apos;t try to sell me a vehicle that they wanted off the lot. He also let me test drive the ones I wanted to compare even if it was not in the most ideal spot, if other vehicles needed to moved it was done. Excellent dealership to work with. So happy with truck. Also, dealership was very nice, friendly and caters to the customer. My salesman was Ryan Pennington, who is new. He was very enjoyable to work with, responsive, and what he didn't know, he would find out quickly. That being said, for just starting, he knew a lot about the vehicle. Clayton his manager was very outgoing, and a pleasure to speak with as well. The manager Josh Rose helped me locate the vehicle I wanted, and was integral in working out the details, and a great deal where I felt I was getting the best possible price without having to scour the internet too much. He made the purchase an easy and enjoyable transaction. Jim from finance was also very knowledgeable and made the rest a breeze, including working through the warranty packages. Would definitely buy again from this dealership, and would certainly recommend. Thanks! 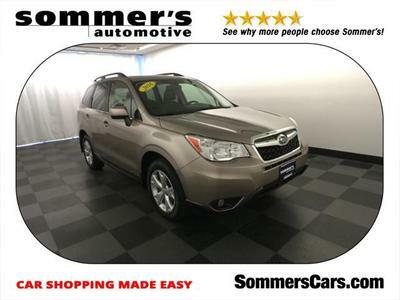 We just purchased our third Subaru Forester. Corey has always been our sales person. He is very knowledgeable about the cars and showed us all the difference in the models. I have and will continue to recommend Wilde Subaru. Everyone was courteous and helpful. This is my second new car that I bought at Toyota of Brookfield. I recommend this dealer to friends and relatives. I drive an hour and a half just to get the great customer service at Sommers. I highly recommend them. I was looking for a fairly rare car. Sommer?? ?s had the car I wanted and it was In the condition I wanted. Craig answered all of my questions and didn?? ?t pressure me in any way. Great experience! As always, Phil takes great care of me and my Forester. We were in and out in a flash and everything checked out... giving me piece of mind after my long road trip. Price matched quote. Car matched quote. No surprise fees. Modern facility. Nice people. Made me feel like they wanted to earn my business. Highly recommend Sommers. I am a real customer and bought an outback. First class service throughout the sales process. We were very pleased with the process from the start of the sales process through delivery. While their was a minor hiccup at delivery, the issue was resolved quickly and to our satisfaction. Jim was very knowledgeable and really add a lot of value to my decision making process. He made purchasing as simple as possible and had everything take care of. Incredibly happy with my new Subaru.